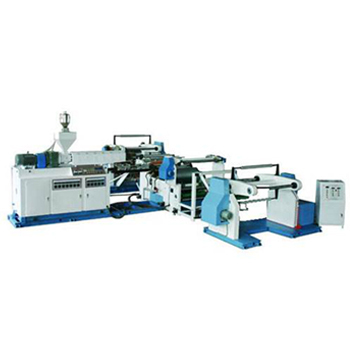 High Speed Extrusion and Lamination Machine applications for laminating different material,paper with plastic film,woven material with plastic film,plastic film with plastic film,etc. 1. Adopts Double-station Unwind Stand rack to load jumbo roll onto unwind stand. 2. Adopts Automatic Gas Type Edge Correcting Control System to keep material edge in straight,with high precision. 3. Adopts Automatic Tension Control System to keep constant for machine working. 4. Adopts Three(3) rollers laminating compounded structure and pressure roller makes laminating rubber roller with even pressure and laminate strongly. 5. Adopts laminating and filling regulation roller effectively overcome defects such as uneven thickness film. 6. Adopts disc type blade for cutting and size is φ40*25mm. 7. Adopts Surface Rewinding System,with double-station.